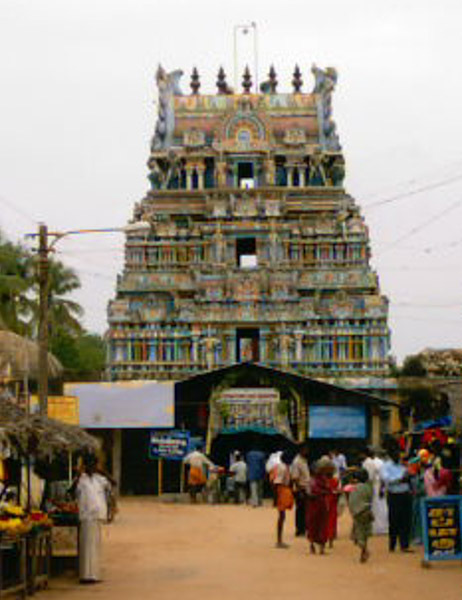 Sooriyanar Temple is near Kumbakonam, approachable by Kumbakonam - Mayiladuthurai road. It is around 2 km to the north of Aduthurai and the temple is well connected from lower Anicut and Thiruppanandal. Actually this temple is part of Prananadheswarar temple ,Thirumangalakudi, a temple dedicated to Lord Shiva, and Suriyankoil is situated north east from this temple. According to Markandeya purana, it Was Brahma who created the Sun, the Lord Suriyan,, to dispel the darkness of the universe. Lord Sun married the daughter of Thuvashta, Sanjeehai also known as Usha. They gave birth to Vaithasumanu,Yaman and Aswini. As Usha could not tolerate the radiating heat from her husband,Sun, she created a shadow of herself called Sayadevi to be with him and she left him. This Sayadevi is known as Prathyuksha, and she lived with Sun without revealing her true identity. They gave birth to two sons, Savarnimanu and Sani and a daughter Pathirai. Lord Sun eventually came to know that the Usha had left him and went in search of her. In a forest he saw her doing a penance in the form of a horse. He convinced her with kind words and took her back with him. These two devis, Usha(Sanjeehai) and Saya from then onwards are always together with the Sun. It can be inferred that 'Usha kalam' the sunrise and 'Saya kalam' , the sunset are considered as the two devis. As per legend to this temple, Sage Kalava Muni was suffering from leprosy. He worshipped all the grahas (planets) begging for cure. All the nine grahas granted cure to this rishi. Lord Brahmma got angry that in accordance with the orders of Lord Shiva, the planets were created to give the effects of good and evil according to the deeds of the individuals and that the grahas can not grant any boons to a devotee directly. Brahma cursed them to suffer from leprosy disease themselves. The planets came down to a jungle in the Earth , called 'Vellerukku vanam' and performed penance towards Lord Shiva for relief. Lord Shiva appeared before them and said that henceforth they can have their own sthalas and can grace the devotees who worship them . There are only two temples in India dedicated to Sun God, one at Konark in North India and this Suriyanar temple in South India. There is no idol worship in the Konark temple, while this temple has the idols of Sun with his consorts,Prathyuksha and Sayadevi. This temple resembles a chariot. You can see beautifully carved figures of horses on the four corners on the roof of the sanctum. Lord Sun graces from the east of sanctum facing west. He is seen holding a lotus in both hands. Sun’s vahana (vehicle) is before him, similar to Nandhi before Lord Shiva. There is an uniqueness that this temple is dedicated to the nine planets known as Navagrahas. The devotee can worship all the planets as presiding deities. In other temples, the planets are generally considered as sub-deities. Each grahas has their own shrine in this temple. The temple that is dedicated to Lord Shiva, Prananatheswara along with Mangala Nayaki is called Thirumangalakudi and the Navgraha temple with Sun as the main deity is known as Suriyanar Koil. 10 days Ratha Sapthami in the Tamil month Thai (January-February) is a very important festival in the temple. This marks the Sun’s change of direction from South to North beginning the six months called Utharayanam from Thai to Aani month (June-July). 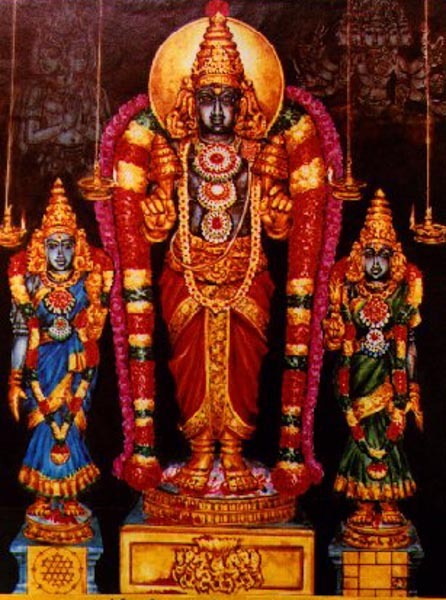 On the first day of each Tamil month special poojas are performed to Lord Suriyan who heads the Navagrahas. You have to get down at Aduthurai Railway Station and catch the bus bound for Lower Anicut to visit the temple. As it is very near to the temple town Kumbakonam, plan your visit such that you visit maximum temples around here. There many buses, Auto rickshaws that can take you herefrom Kumbakonam.